The Park Street Tavern is located just a stone’s throw from downtown Columbus right across the street from the North Market, situated in between Columbus’s most popular dance clubs. Inside you will find brick walls, a beautiful dark wood bar, and a glass front that looks out onto Park street and its bustling night life. 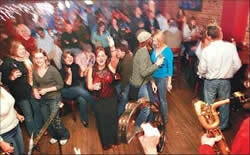 Occupying the old 501 Jazz Club space, Park Street Tavern offers live music throughout the week. Depending on the night, you can hear anything from jazz, to funk/R&B, to alternative, to rock and roll, to bluegrass to reggae. Of note is the Tuesday Jazz Jam with the Pete Mills Quartet, where the house band, often joined by special guests, plays the first set and the second set opens the stage to area jazz musicians to jam. The Tony Monaco Trio plays an annual Christmas show here, and other local jazz artists play shows here on occasion.